This year’s Art Basel/Design Miami was a wash. 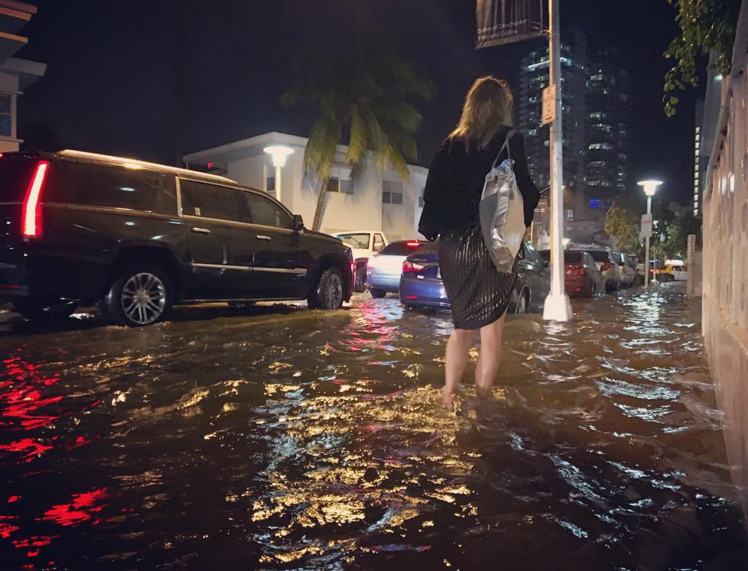 The tallest stilettos could not save feet from floodwaters that inundated streets and forced partygoers under small tents. Even when it’s not raining, water bubbles up through stormwater grates and sewers, a result of the city’s porous limestone bedrock. Miami Beach is a barrier island that is routinely battered by hurricanes and floods. With global warming, the bad floods will only get worse. The U.S. Army Corps of Engineers, NASA, and NOAA predict sea level rise between eight inches and six feet by 2100. 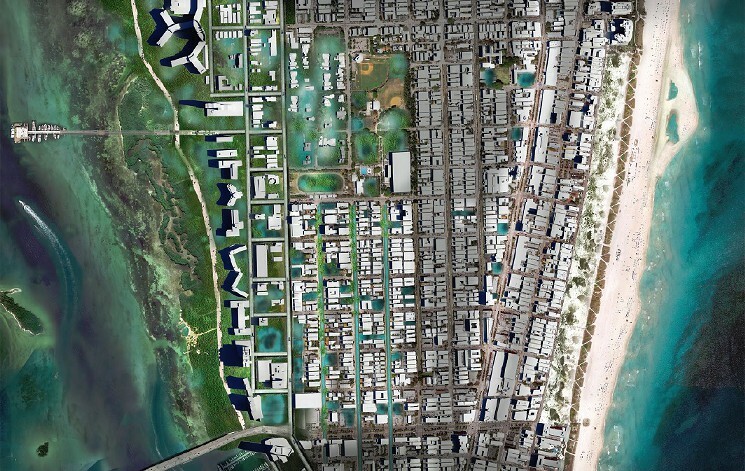 For these reasons, Harvard GSD’s newly established Design Office for Urbanization selected Miami Beach as its first focus site. 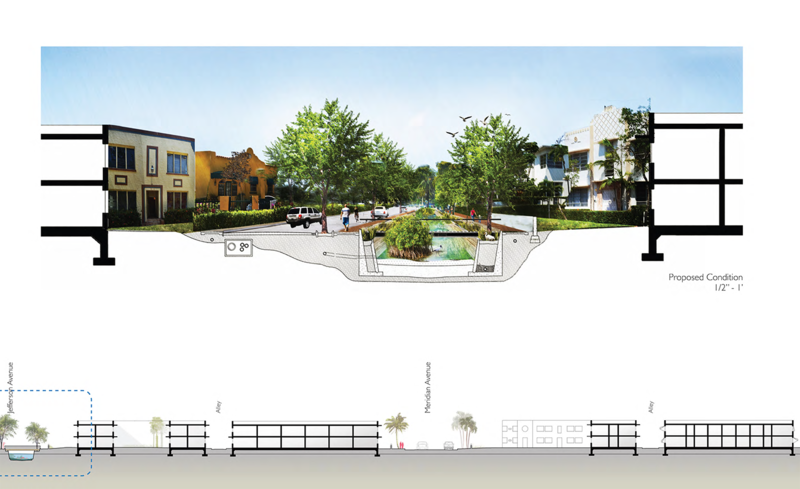 Though unaffiliated with Harvard, a recent Florida architecture grad would make a great contribution to the program. 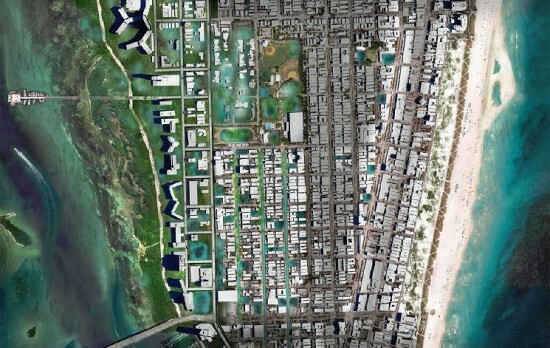 Designer Isaac Stein, at West 8‘s New York office, envisions a solution for incorporating rising seas into Miami Beach’s urban design, Vanity Fair reports. 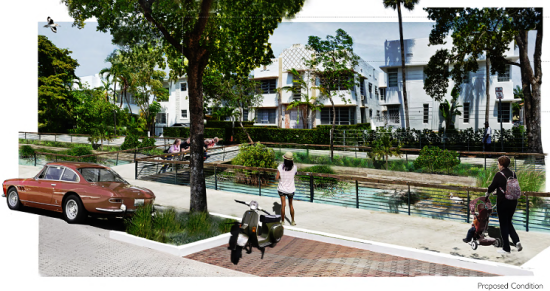 While completing an undergraduate degree in architecture at the University of Miami, Stein drafted a plan for a mangrove forest, raised buildings, canals, and other design interventions that will bend to, not fight, the rising seas. The plan focuses on South Beach proper, from 5th to 15th Streets. 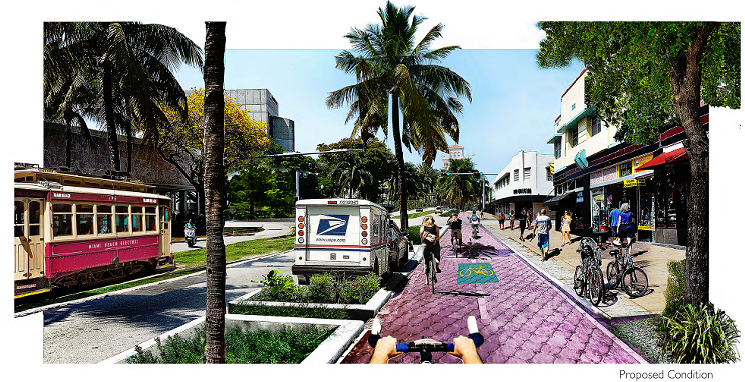 One of Miami Beach’s main thoroughfares, Alton Road, would be raised on stilts to accomodate floodwater. Trams would replace cars, and bike lanes would be installed along Washington Avenue, roughly parallel to and a few blocks inland from the Atlantic. Historically, Miami Beach’s western (bay) side was lined with mangroves. Stein’s plan restores the mangrove forest to provide a natural buffer against rising water. Canals would be cut in the medians Michigan, Jefferson, and Lenox Avenues. The resulting fill could be used to raise buildings and roads 1.5 feet above grade, would safeguard the city against six feet of sea level rise.